The NOOK Tablet offers some special features for kids (and those who sit by their side as they discover the joys of reading) with special features that are part of the NOOK Kids picture books. 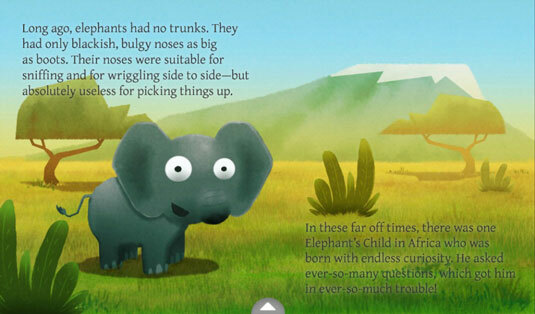 Some children’s books have a bit of animation that you can set into motion by tapping the screen; others read aloud parts of the book. To make text bigger, double-tap it to enlarge it. Double-tap to return to the original size and position. To make text bigger, zoom in by pinching in on the image and text. Drag an image to move it around on the page. Swipe to the left (drag your finger from right to left across the screen) to go forward. Tap anywhere on the right edge of the screen. To go backwards in the book, swipe to the right or tap the left side. Tap the white arrow at the bottom of the screen. Small pages from the book appear. Slide your finger across the images. Tap the small image of the page you want to read. Some children’s books can narrate. Others move. These special features appear only if the book includes them. Just the words and pictures. Tap the blue button to open the book. Some special activities may be marked with a white star; tap the star to play. Better yet, let a kid tap the star. Read and Play books have audio tracks, and interactive features, marked with a white star. 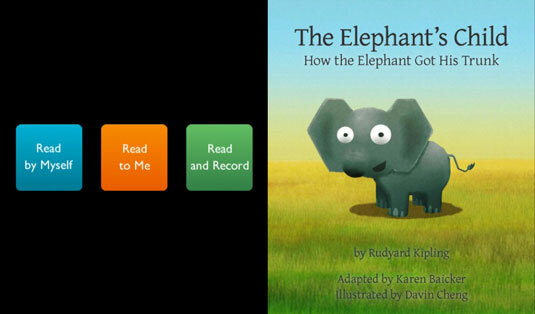 Tap the orange Read to Me, or the purple Read and Play buttons to hear the author or an actor read aloud. If you’re enjoying a Read and Play book, you can only turn the pages by tapping the onscreen arrows. The pages won’t turn if you tap them. Tap the cover of a kid’s book that has the Read and Record feature. On the opening screen, tap the green Read and Record button. The book opens to the first page. Tap the green Read and Record button. It will change to a Stop button. But don’t stop. The tiny hole on the right side of the NOOK Tablet is the microphone. Don’t cover it with your hand while you’re recording. Hold the tablet about 15 inches away from your mouth. Try to record in a quiet place without background noise. When you’re done recording, tap the Stop button. If you’d like to hear your recording right away, press the Play button. Press the Pause button when you’re done listening. If you’re a perfectionist (or if someone dropped a pile of plates while the microphone was on), press the Re-record button to do it again. To keep recording, swipe or tap to the next page and then tap the Record button. To end a recording session at any time, tap the Done button in the lower left. A screen asks you to choose a picture as a symbol. Type a name for the recording. To play a recording, open the book and tap the picture icon for the file you created. To re-record, change the name, or delete the audio file, tap the Edit button next to the picture icon and then choose the option you want.